At Cotton Crews we provide two types of hiring service – the Cotton Crew Club, our personalized luxury yacht crew sourcing agency, and our Cotton Crew Hire app. Our bespoke service is second-to-none, offering expert recruitment consultation from our team of specialists. However, we know that sometimes you just want to be able to source yacht crew yourself. We also know that when taking this route, you want to be sure you get high-quality crew members – ones who will show up on time, stay smiling and professional all day long and work hard. That’s where our yacht crew finder app comes in. Cotton Crew Hire is the industry’s most up-to-date database of crew, available to download for free on your Apple or Android smartphone. Find out more about how it works, and join the hundreds of hiring managers already using the app to find a crew on the move. Source new boat crew at any time of the day or evening – ideal for last-minute recruitment. Access our wide network of candidates to find the right person to join your crew, whether you’re looking for a dayworker or a permanent team member. Our yacht crew finder also allows you to filter candidates by position, experience, nationality, language, skills, and qualifications, meaning you don’t waste time scrolling through irrelevant profiles. Alongside viewing CVs, you can also see references from our candidates’ former employers, as well as any notes that our team has put against their name. For fast and efficient hiring, there’s nothing better! Our crew finder app is free to download and try out. Once you’ve decided Cotton Crew Hire is right for you, you can choose to unlock our premium features, allowing you to download candidates’ CVs and chat directly with potentials. This costs $50 a day or $250 for a week, and you can hire an unlimited number of crew and dayworkers in this time. As those who are used to using more traditional recruitment methods will know, it comes at a fraction of the price while providing a truly amazing service. Who is the Cotton Crew Hire app for? Our yacht crew finder app is for everyone who wants a more streamlined, tech-friendly hiring experience; those who are tired of sorting through piles of out-of-date CVs, greeting unsuitable dockwalkers and calling candidates who are no longer available. Cotton Crew Hire is here to help anyone who needs to find a fantastic crew. We only show you candidates who are actively seeking work, making the life of a hiring manager a whole lot easier. 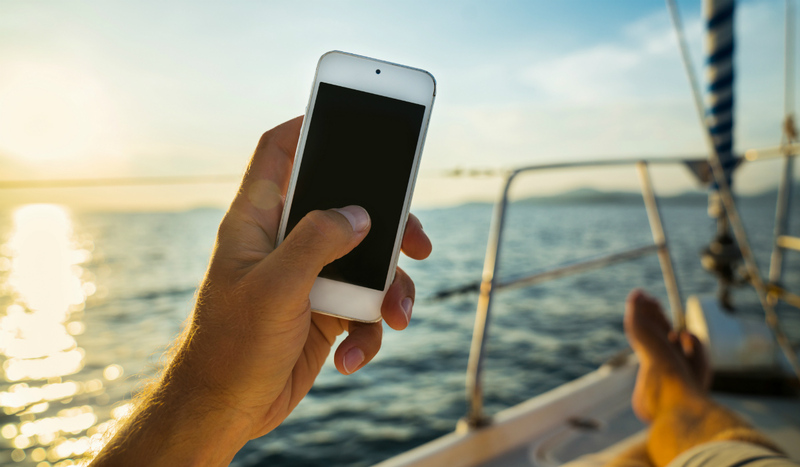 Whether you are a crew agent, Captain, chief steward/ess, chief engineer, chef, or house manager, and whether you’re hiring for motor, sail, temporary or permanent opportunities, our yacht crew finder app is for you. How do I use Cotton Crew Hire to find a crew? Once you’ve downloaded the app, create an account to get started. Browse all our fantastic candidates in your area to find crew, filtering as needed to find a crew member that’s perfect for you. Once you’ve found a profile you like, you can message them directly on the app. Alternatively, post any crew jobs by entering a job description, salary, start date and location. This way, any interested candidates can contact you through the yacht crew finder app, meaning you can sit back and watch the applications roll in! The fact that Cotton Crew Hire is on your smartphone allows you to alter job posts or check out profiles whenever and wherever suits you – perfect for traveling Captains. View our FAQs below for any further information, or contact Lauren and the team. Need more customized service? Don't want to use an App? We have just the thing! Allow our placement specialists at the Cotton Crews Club, our boutique placement service, to do all the work for you! We will work swiftly to find crew members who fit your needs and interested in working on your boat. Simply download the “Cotton Crew HIRE – Find Yacht Crew” app for captains and hiring managers and create an account. Once logged-in, you can view all the available crew in your area in real time! Filter crew results based on position, experience, nationality, language, skills, and qualifications. You can also post a job and have qualifying crew apply directly in the app! Simply enter the job description, set the pay, the start date, location and a brief description. Manage all job posting and review applications via the app at any time 24/7! It’s free to download Cotton Crew HIRE App. However, premium features such as CV downloads and chat can be unlocked daily for $50. Or try for a week at $250 and hire an unlimited number of crew and dayworkers. Compared to existing methods of finding crew, Cotton Crew HIRE App offers this service in real-time at a fraction of the cost. Why Use Cotton Crew HIRE App? You can absolutely still find crew the old-fashioned way: job boards, Facebook, dockwalkers, sifting through piles and piles of CVs, and calling workers who are not qualified or not available. Cotton Crew HIRE App will only show you active crew members, include when they last checked-in, current location, and star-ratings and reviews! Do I Have To Be A Captain To Download The HIRE App? Not at all. If you are a hiring manager – crew agent, captain, chief steward/ess, chief engineer, chef, house manager – you can download and use the app. Anyone who is looking to hire the best yacht crew can download the HIRE app. Can I Use Cotton Crews For Placement Without The App? Will The Cotton Crew HIRE App Work To Find Dayworkers? You bet! The app pulls candidates based on their location. Whether you need a dayworker in the shipyard or someone to drive your tender, the Cotton Crew JOBS app will show you who is available in real time. – On iPhone, tap PAYMENT. – After making changes/updates, tap Save. In order to verify your payment method, we may issue a small authorization hold. This amount is never actually charged to your account, but you may see it as “pending”. All authorization holds are voided within a few business days, depending on your bank’s policy. We issue authorization holds as a way to better protect against fraud that may result from unauthorized card usage. If you would like to confirm a specific item on your statement, please contact your bank directly. Error Adding A Payment Method? If a CVV number or billing zip code is entered incorrectly, you may later receive a message about an error processing your payment method after a trip. Try removing the payment method from your Cotton Crew HIRE account. Add it again, making sure all info is correct. Please note that Cotton Crew HIRE app does not currently accept prepaid cards. If you attempt to add or sign up with a prepaid card, you may receive an error message. How Do I Identify An Unknown Charge? – Is the charge for unlocking fee? – Is someone you know using your account? – Were you charged a cancellation fee? – Is the charge an authorization hold? When a payment method on your Cotton Crew HIRE account is newly added or unused for several days, we will verify it by issuing an authorization hold. Authorization holds are small amounts that appear as “pending” but are never actually charged to your account. These are voided within a few business days, depending on your bank’s policy. We issue authorization holds to protect against fraud that can result from unauthorized card usage. If you’re still unable to recognize an Cotton Crew HIRE charge on your account, please provide some additional info to Jobs@CottonCrews.com with subject heading “UNKNOWN CHARGE”. We’ll be happy to take a look. Even if you see multiple unrecognized charges, please describe just one to get started. Download the “Cotton Crew Hire” app from the Apple App Store. Devices with iOS 7 and newer are supported. Using your phone, tap the App Store icon. 3. In the search box, type “Cotton Crew Hire”. When installation is complete, INSTALL will change to OPEN. Tap OPEN to set up or access your Cotton Crew Hire account and request a crew. You will be alerted when a new crew member applies for the job via email and app notification. You can review all applicants by job posting from the JOB POSTS section of the app (on the main menu). How Do I Search For Crew? The results will be displayed on the following page. If you’d like to add more filters to your search, hit the BACK button arrow on the top left. Can I Use The App Even If I’m Not A Captain? If you are a crew agent, management company, senior crew, or a hiring manager of any type you can use the app to find qualified crew. Simply sign-up for an account and pick a payment plan that works for you. Is the Cotton Crew HIRE App Available 24-7 Globally? Yes, Cotton Crew is available to use worldwide! Use Cotton Crew to hire crew in any port you arrive in. Our app allows you to search our entire database 24/7…..anytime you’re looking for crew! Fill in your first and last name, phone number, email address and choose a profile picture. Next, enter your payment information. Adding a credit card or debit card number allows you to pay for premium content with our daily membership fees that unlock premium content for a period of 24 hrs. After providing this info, we’ll send an email to confirm your payment. Cotton Crew has 2 versions: HIRE app (Blue logo) for captains and hiring managers and a JOBS app (Green logo) for yacht crew looking for work. These apps are downloaded and used separately. If your app doesn’t display the “available/not available” toggle at the bottom of your home screen, you may be using the captain version, Cotton Crew HIRE app by mistake. If you’d like to work as crew, please download Cotton Crew JOBS. Where Can I Delete Or Edit My Job Posts? From the main menu button on the top left corner, select JOB POSTS. Here you’ll see all your previous and current job postings. Press and hold down your finger and swipe left to reveal the red “DELETE” button. Tap DELETE to remove this listing from your history and to remove the posting from the Crew App. You will no longer receive applications for this job. Unfortunately, you will not be able to edit the job posting, only to delete it and create a new job post. Where Can I View All Crew Profiles Who Applied To My Job? Unfortunately you will not be able to edit the job posting, only to delete it and create a new job post. How Do I Download Crew CVs? Downloading a crew CV can be accessed once the “unlocking fee” is paid with a payment method associated with your account. Once payment is made, you have access to all premium features for 24 hrs including downloading a crew CV and chatting via the app. You can opt to download and view the CV on your phone or have it emailed to you. How Do I Direct Chat With Crew On The App? – After your payment package expires, you will no longer be able to continue communication unless you pay for another unlocking fee.